We remember the first time we saw a VanMoof, in 2009. But then, everybody remembers seeing one the first time: they are strikingly different, with a massive top tube that extends beyond head and seat tubes, the ends then plugged with head and taillight. 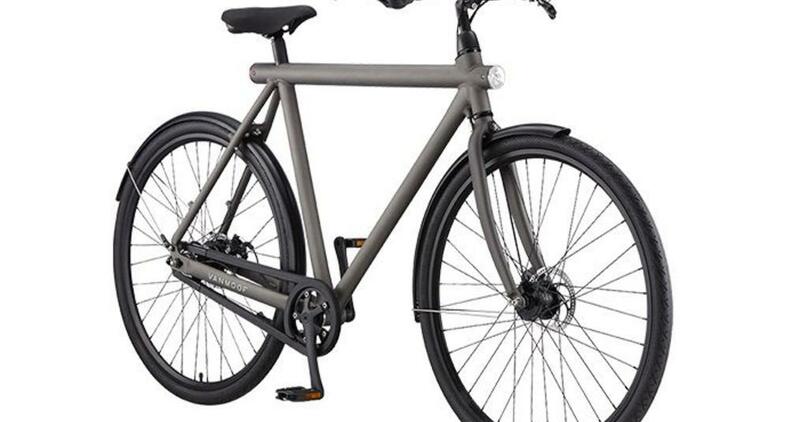 They must be on to something 5 years early, because 3 of the 5 entrants in 2014's Oregon Manifest design competition for the "Ultimate Urban Utility Bike" also play with this visual and functional design element. We believe that a distinctive look in bikes is as naturally desirable as in shoes, but the early VanMoofs were a little too spare in function to hold our interest. This has changed completely now with the current, third-generation product line. Full chaincases: who needs a belt, really, when your chain stays clean and off your clothes? Full metal fenders, kickstand, brass bell, OF COURSE. We could go on. All of the above come in right over the $1K mark, which is pretty great value. A little less gets you a 3-speed. A little more, a nifty ABUS chain lock integrated into that top tube. A lot more gets you the VanMoof Electrified, which is the freshest, cleanest, almost even pure electric assist bike we've yet seen. The battery is in the top tube. (See, it's not so massive just for looks!) It's a 2-speed automatic, 2 speeds proving surprisingly adequate when a motor is added. It has no throttle. What these things mean together is an unprecedented ergonomic simplicity. While other electric bikes add complexity in operation, VanMoof takes away: you can even ride no-hands uphill with no restriction of function except braking. While it's extra clean in operation, it packs a lot of technology inside, including bottom-bracket torque sensing, remote keyfob power switch and GPS anti-theft tracking! Super lightweight for an electric bike, too. What we can't convey in words is the ride, very distinctively Dutch in relaxed, smooth, even stately uprightness. One key is the exceptionally low bottom bracket, meaning that it's easy to get a foot down at stops without needing to lean the bike.